Title: Chapter XV: Can We Keep Him? On Knowhere, Sam Alexander meets Cosmo. The telepathic dog reveals that Skaarn has poisoned him and also shot him with something to dampen his powers. Sam picks him up and begins searching for a doctor. Later, Sam cuts a hole into the sickbay and asks for help. An alien doctor takes a look at him but says that Skaarn's pirates have cut power to the section rendering their diagnostic equipment useless. 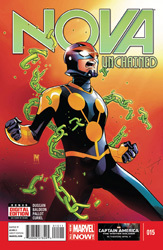 Nova uses the Nova Force to locate the poison. The doctor is able to remove the dart and begins stabilizing Cosmo. Cosmo informs the teenager that Skaarn is looking for the Continuum Cortex. At the cortex, the pirate is explaining to his new allies, The Disavowed of Galadoria, his plan. Skaarn intends to use the teleporter to get inside a heavily protected vault orbiting a quasar. He tells them he needs an eight hour head start followed by their teleportation and escape. Skaarn leaves to begin his scheme. Thirty seconds later, Nova arrives looking for Skaarn! The three armored villains laugh and tell him to go back to his quarters. Sam responds by blasting Nujin into the wall! Bakin returns fire with a white-hot thermal blast! The teen grabs Bakin and they fly through the wall and land in an organic globular mess. The two comment and laugh about how disgusting it is. Sam stops laughing and hits his foe. Suddenly, the remaining attacker launches a mental assault on Nova. Klax's attack warps Sam's sense of reality and begins compressing his mind! The hero grabs the two Galadorians legs and fuses them together with the Nova Force! Regaining his balance, Sam knocks his attackers out with a single punch. Without warning, Nujin blasts Nova from behind! The teenager from Earth finds himself landing back in sickbay. As Nujin pulls his sword back to decapitate Nova, Cosmo freezes his body with a telepathic command. Sam takes the opportunity to take all three of the Disavowed and places them on the Continuum Cortex. 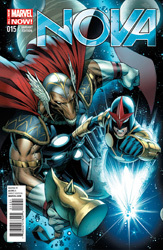 Nova quickly activates the cortex and unintentionally sends them to Jotunheim (where Beta Ray Bill had been teleported earlier)! Back on Knowhere, Cosmo explains that it will be a few hours until the rendevous time with Skaarn. He advises Sam to rest. Sam Alexander explains that he needs to get back home during the break. Cosmo telepathically sees where Sam wants to go and teleports him back to Carefree, Arizona. At the Carefree High School, Sam finds himself teleported into the girl's restroom. He runs out and realizes he's going to be late for class! He grabs the Nova helmet and flies over the school and into the correct classroom just as Principal Philbin comes in. As the school day goes on, Sam receives a note from Carrie saying he owes her $70 for babysitting, he sleeps through math class and gym, and agrees with his science teacher that alien life doesn't visit Earth. He does it only as a way of poking fun at Karl Moffet. After school, Sam flies back to Knowhere and rejoins Beta Ray Bill and Cosmo. As the two begin their teleport, Bill reveals the vault Skaarn went to is a secret weapons storage facility. The Korbonite feels they should be grateful they are going to stop Skaarn before he gets inside the vault. However, when they arrive, the two heroes discover Skaarn has already gained his prize - the power staff of Galactus's herald Stardust!